Is Bollywood A Hollywood Clone? Take a Hollywood plot, sprinkle in cheesy song-and-dance numbers and pour in a gallon of melodrama. Shake well, and you've got a Bollywood movie. But Bollywood, which churns out some 800 movies annually, may be forced to alter its recipe after best-selling novelist Barbara Taylor Bradford persuaded India's Supreme Court last month to ban a 260-part TV series that she claimed stole heavily from her novels. Bradford's "A Woman of Substance" and two sequels deal with a woman's struggle to establish herself. 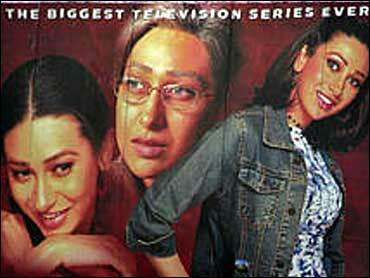 In the TV series, "Karishma - The Miracles of Destiny," Bollywood actress Karishma Kapoor overcomes obstacles to become a business tycoon. A spokesman for Sahara TV, the producer of the series, declined to comment as Sahara has appealed. India's movie industry has never hidden its fascination for Hollywood. Even its name suggests it's a happy clone. Bollywood writers told The Associated Press how colleagues furiously scribble dialogue while watching the latest Hollywood DVD and directors study the DVD on the set before copying the movie frame by frame. Tarun Adarsh, editor of the Bombay-based Trade Guide magazine, said up to 60 percent of Bollywood films were remakes of old Indian films or Hollywood movies. "Today's writers are mere translators," Adarsh said. "People lift stories, characterizations, plots, situations, even the way a frame is taken. They may say they were inspired by Hollywood, but they know in their heart that they have copied." Some Indian directors deny this, saying a Hollywood movie would never sell in India unless it had been "Indianized." While conceding Bollywood does often copy Hollywood films "dialogue to dialogue," director Sanjay Gadhvi said his movie "My Friend's Wedding" - in which the male lead tries to ruin the marriage of a childhood friend - drew from earlier Hindi films and not from 1997's "My Best Friend's Wedding," which starred Julia Roberts. Gadhvi said the Roberts film provided less than 1 percent of the inspiration for his movie. "This is minuscule. You can only draw a parallel with the title and the plot," Gadhvi said in an interview. "There is a similarity, but it's not a copy." However, he said the Bradford court case would make filmmakers think twice before borrowing from Hollywood. "But they borrow out of necessity," Gadhvi added. "America has great writers. We don't have good writers." Komal Nata, editor of trade guide Film Information, called Gadhvi's remark a "shortcut and escapist comment." "Attention is paid to the costume designer, to the actor, but not to the writer, who is the film's backbone," Nata said. "It's a sad state. Nobody wants to devote time to the creative process." Veteran writer-director Mahesh Bhatt said the courts would find it difficult to pinpoint plagiarism. "When you take an idea and route it through the Indian heart, it changes entirely," said Bhatt. "You cannot pin a person down on an idea." Isn't his recent thriller, "Secret," similar to 2000's Harrison Ford-Michelle Pfeiffer film, "What Lies Beneath"? No, says Bhatt, insisting his source is Hindu mythology. "The only similarity is the house and the presence of a ghost that happens to be the ghost of the husband's lover," Bhatt said. "The similarity ends there." Aabad Ponda, a lawyer who represents top Bollywood stars, said the Bradford case might make producers more cautious, but filmmakers know they are protected by the lumbering Indian legal system. "For litigation in India, you need a terrific amount of time, money and energy," he said. "And most people are not ready to spend that kind of time." The outspoken Bhatt is among many in Bollywood who fall back on the argument that there is no original idea. "As far as I'm concerned the human brain is incapable of creating something original. We are a recycling bin," he said. Tigmanshu Dhulia, a young director, disputes this. Dhulia said he was forced to turn to friends to finance his debut film, "Acquired," when producers said they would only finance Hollywood remakes. "It's just easier to copy Hollywood," he said. "The very name Bollywood - what you are saying is that you are copycats."